MFPS 2.0 ALPHA VERSION NOW AVAILABLE! MFPS 2.0 is now available in alpha version, that mean that any user can buy it now for download to test and start to familiarized with it, this version have all featured described below integrated but as alpha version it are not fully tested and may contain some errors that will be fixed in time, also new features can be added in next updates based in feedback of buyers. Documentation is still in development so, if you have any question about something please post here and I will focus on explain it first. -FIX: Health player show decimals. -ADD: Show max kills to win in the top scoreboard UI. -IMPROVE: AutoTeam UI to UGUI. -IMPROVE: Chat input field design. -ADD: Now show the group target of chat (Team or All) in the input field. -ADD: Option for enable or disable bullet trail effect. -ADD: Option for enable / disable SSAO effect in settings menu in game. -ADD: Option for set up the sensitivity when AIM / Scope in settings menu. -FIX: Unity freeze after second play time. 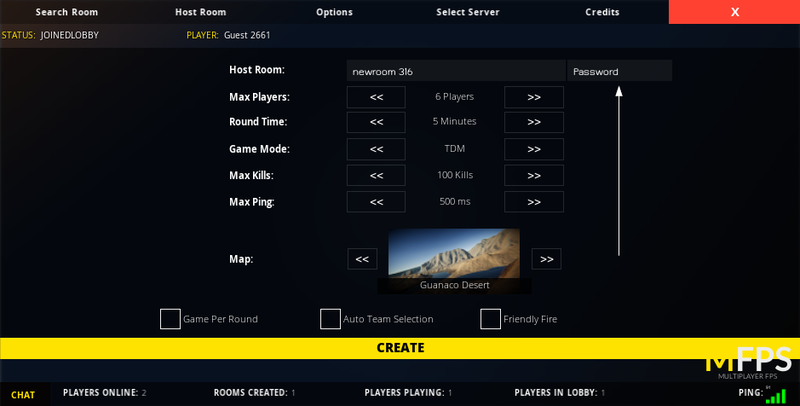 -ADD: Re-introduced spectator mode in game menu with UGUI. -RE-ADD: Crouch system integrated with mecanim. -FIX: Countdown start when leave the room manually. -IMPROVE: Black screen when leave match. -ADD: Now players can change of team in middle of room (Optional by the dev). -FIX: Player still can move when room menu is open. -FIX: When open chat with 'T' or 'Y' the input field appear with the char write. -FIX: Crosshair keep showing when open room menu. -FIX: Instance kit particle effect never get destroyed if player die before it play. -FIX: Can't unlock cursor when is in spectator mode. 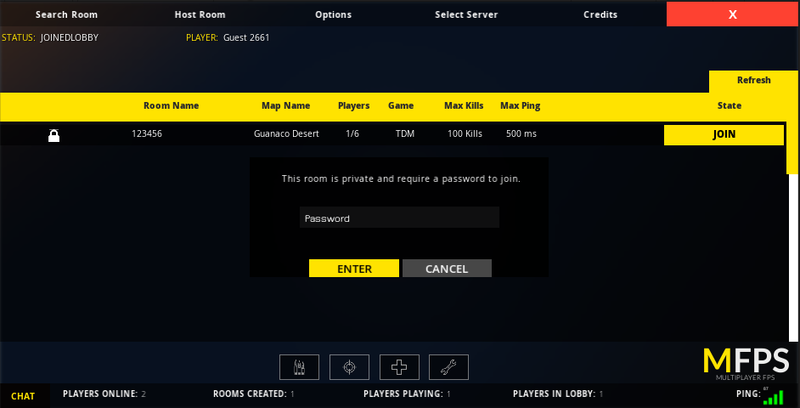 -ADD: Private match, now can create rooms and set a password to join. -IMPROVE: Water of example map now is interact-able with footsteps and bullet impact. -FIX: When AI bot pass over a pick up gun, it detect like it were the local player. -FIX: Array index exception in max ping list of lobby. -ADD: Background sound in lobby with fade in / out effect. -IMPROVED: Joining to room fade UI. -FIX: Update manager keep updating desactive game objects, this fix will improve the performance a little bit more. -CHANGE: Now player prefabs are assigned in 'GameData' instead of in bl_GameManager of each scene. 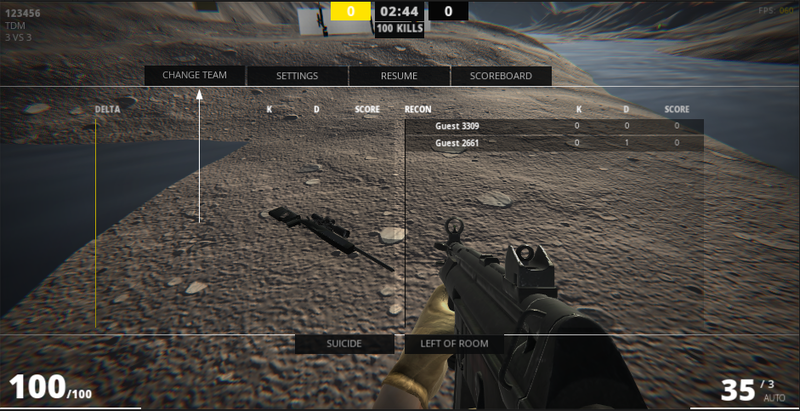 -ADD: Now player can drop gun when die (Optional by the dev) and other players can take it. -ADD: Now can destroy the 'Dummy AI', you can cause damage and destroy the AI over network. -IMPROVE: Also if you hit the AI and this are not follow other player it will follow you no matter the distance, also speed will increase. -FIX: Fire sound play each time that a remote player switch weapon. -IMPROVE: Remote player view rotation is not match with local view. A tutorial for change the player model is available now, show how use the new tool, but this is beta so let me know if you have problems with it. with the new systems add ons are automatically integrated, if you have any of these addons, you can download from the web site in the download section, if you have problems with it can contact me directly with the number of order purchase and I will send the link to download the addon. - Super Jump was remove. Q: Will be available in Asset Store? A: I will send to review after an stable build, but will depend of Asset Store team if it will be accepted or not. Regarding price I don't find it fair to the old buyers. Comparing it to UFPS which is $75 and UFPS Photon Multiplayer which is $20, not only a buyer can make a story mode easily but it also has better functionality and a whole lot more options. MFPS itself cost old buyers $50 and old buyers having to pay MORE just to get MFPS 2.0 which is supposed to be an Update just doesn't seem fair to anyone of us. I thought about it which is why I said what I said. I also forgot to add the "Addons" for MFPS such as other game modes, Minimap, etc. A lot of us depends on MFPS addons just to make our games work but if you are going to release another MFPS version but not provide the old buyers with the update when it is SUPPOSED to be an Update then it feels like a rip off. The $50 we paid for MFPS meant all upgrades/updates should be free forever? Yeah? But now you are going to make old MFPS legacy and work on MFPS 2.0 just to get more money and old buyers would have to pay more on top of all the addons they paid for and MFPS, not to forget those who bought MFP, MFPS and other Lovatto assets from asset store. I just don't think that this is doing us buyers/supporters any justice. - just let me clear it for you, this new MFPS 2.0 will be separate / posterior of MFPS not an pay update (future updates of MFPS still will be free), who buy MFPS 2.0 will not have access to MFPS at least that he buy it, due in MFPS 2.0 much system will be different, will have new features but also will remove some system of MFPS for optimization finish, my objective is that MFPS 2.0 can be available on the Asset Store, this is the main reason for I need rebuild a lot of systems on actual version to avoid past tragedies, current buyers still can use actual version it will update with the same pattern so far (optimizing, bugs fixing, compatibility fix,etc..), I will continue to support it. Looks like it'll be good, Is the MFPS 2.0 will compatible with current mfps addon? And I hope so gunbobbing will be better than current mfps. Also wanna see kill limit on match, so when player reach kill limit then round end. I think MFPS 2 must use better network infrastructure like Forge. CCU is big problem for developers. In my opinion for better game play experience network infrastructure change is mandatory. Another suggestion is related about player characters. Adding or changing player models is so hard and take long time. I think player model change must easy. Like a drag and drop a new compatible model. For example we should be able to use MakeHuman models easily without too many action. Also default characters and weapons must be better and realistic in MFPS 2. You should deal with some 3D artists for this. MFPS 2 early access for current customers is good idea to achieve better product. This must be free and standalone. You can build MFPS 2 and share with current customers and we can test it and feedback to you. I hope MFPS 2 will best FPS Kit on the market with awesome features. Keep up good work. So let me get it right. MFPS will get the SAME updates/upgrades like MFPS2.0? Meaning it will get UGUI scoreboard and everything that you are going to add in MFPS 2.0? If that is the case then I'm fine with it. I never said that you as an independent developer making earning is wrong. All I said was since MFPS 2.0 is like an "upgrade" of MFPS then old buyers should get it for free since a lot of software company provides upgrades/updates for free. Determining if a person is a real developer just by saying what you assumed is wrong. I create open source programs and I don't want to charge people for it that doesn't mean I'm not a real developer that just means I enjoy making programs that people might find helpful and can learn from it. Yivlx wrote: So let me get it right. MFPS will get the SAME updates/upgrades like MFPS2.0? Meaning it will get UGUI scoreboard and everything that you are going to add in MFPS 2.0? If that is the case then I'm fine with it..
Yivlx wrote: I create open source programs and I don't want to charge people for it that doesn't mean I'm not a real developer that just means I enjoy making programs that people might find helpful and can learn from it. Very well for you, I can not give myself that luxury of creating just because I enjoy it.